The Funky Felter: It is not about the who, but about the why . . . my top 5 reasons to go vote! What's yours? It is not about the who, but about the why . . . my top 5 reasons to go vote! What's yours? I've seen the blogging community flooded with posts about the upcoming (history making) election here in the U.S. I've always held my right to private voting very dear and seldom share who I will be voting for. As is the case in my public life here on the funky felter blog. I'd rather concentrate on why to vote rather than who I or you are voting for. My best advice about choosing a candidate is to know the issues and vote with your gut and conscious, and that is all that I want to discuss about the candidates. I'd rather give you my top 5 reasons to get out and go vote tomorrow - some funny, some serious, but hopefully all good! My top 5 Reasons to go to the polls tomorrow . . . It is a blessing. To live in a democratic society where you have a voice and a choice is truly an amazing gift! Don't squander it! Whether your candidate wins or loses, you'll have something to talk about. If your candidate wins, you can begin the "I told you so's" and shouts of triumph. And, even if your candidate loses, you will eventually be able to say "Well, *I* didn't vote for him!" because politicians will inevitably mess up at some point in time. This is a history making election that you are alive to be a part of. There will either be the first African American President or the first woman as Vice President. What a great thing to be able to tell your grandkids that you voted in this election. If you were born an American citizen, be thankful by exercising your right to vote and realizing what you are able to do for just being born in the U.S.A. For our legal immigrants who go through the process to become a citizen, they have to do paper work, pass a test, and maybe more. What a privilege it is to be a citizen and to vote! Whatever the outcome, if you vote, you are the winner. Enough said. As I stated earlier, my post is not about who you are voting for, but about why you are voting. I urge you to share why you are taking the time to go vote tomorrow in the comments, but please no candidate endorsements! I'd like to focus on the privilege of voting today. 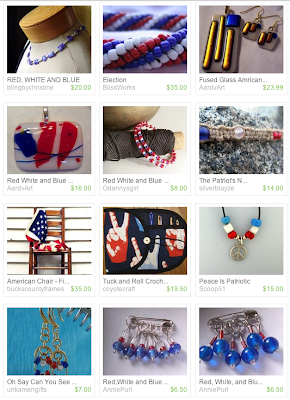 The image is a screen shot of what I found when I searched Etsy for "red white blue patriotic" in honor of today's post. It was really difficult to find a search that did not have a majority of items for specific political candidates. I think that I found a good assortment of patriotic items though. I already sent in my absentee ballot. No way I was sitting this one out! It's a great feeling having voted! We are a blessed nation, indeed that we have our say. Go vote and enjoy the priviledge! Another reason to vote: You can get free coffee at Starbucks if you show your I Voted sticker, as well as a free donut from Krispy Kreme...and I think I heard someone say in line at the polling place that Chick-Fil-A is also giving out free food for voters. I'm voting today, thanks to many who died for the right. It is a Civil Right that was purchased with blood, tears and pain, so I choose to take up the cause and not let the suffering have been in vain. I am an American and I love this country enough to help the process of keeping it great!